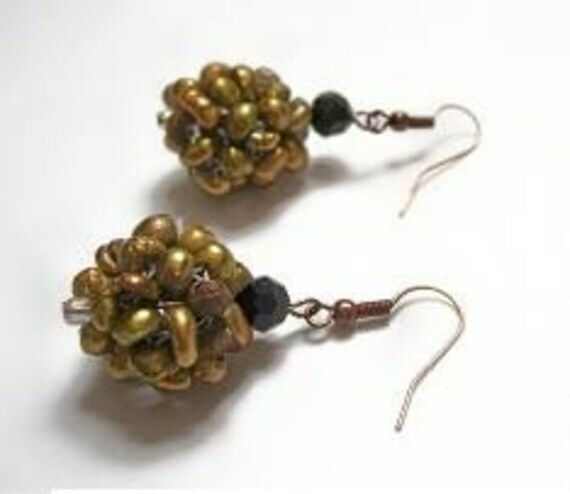 These I call Forrest Clusters...they're cluster of fresh water pearls woven tightly in a mixture of olive and gold tones. I accentuated them with Jolee crystal black beads on a copper ear wire...they measure at least 1.5 inches. These would look great with that favorite dress, sweater for a party or work! These beauties are made with fresh water pearls of two coordinating tones, separated with swarvoski spacers hanging from and antique copper ear wire (I'm starting to really line the different metal tones out there!). These measure 1.5 inches giving you an elegant and classy look! 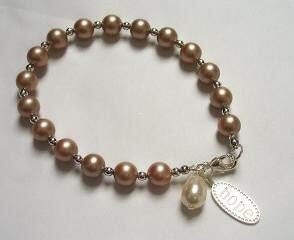 Here I wove together tan fresh water pearls, spaced with silver beads and accentuated with beige tear drop pearl and a Hope Charm (upcycled from Stella & Dot). It has a lobster claw closure measuring 8 inches so your wrist is free to breath and allows you to really show it off! So....if you are headed to a New Years event or any other type of party OR if you like to accentuate your wardrobe...pick up any one (or all LOL) and make sure to add to your collection. Remember...these are all OOAK and no one else will have Simply Shop|323's design! Well thanks for stopping by...Happy New Years and hope it brings you all much success and happiness! Good grief....Christmas is less than 24-hours away and if you are like me, you have plans to hit the store for some LAST minute shopping. My excuse is during the week I work and get home too late to even want to attempt to stop by stores. Parking lots are PACKED and I just don't have the patience to deal with all the craziness! That's why I love online shopping LOL. Here's a new item added at both websites: www.shop323.net and Etsy. 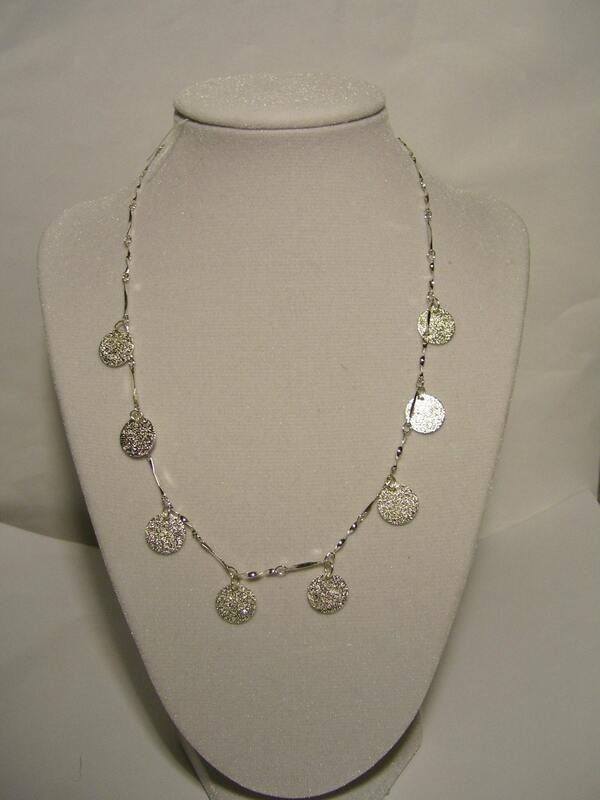 I call it Silver Coin Necklace...silver patterned discs on an 8' sterling silver twisted linked chain. Simple delicate and a fabulous addition to your collection. Layer on this flattering link chain with light sapphire glass beads alternated faceted biscone beads called Chain Reaction. 13 inches in length with an easy twist closure...another fashion piece to add. Don't miss out on this sale on my Etsy --- it's only good for 24 hours! Ok off to get ready to get on the road...wishing you and your loved ones a fabulous and blessed holiday! This is definitely new the collection, a Floral Cluster Earring. 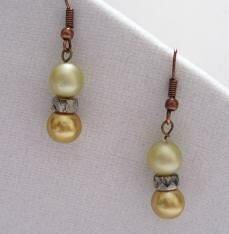 It's made with fresh water rice bead on an antique copper ear wire...Very classic and feminine. Enter Coupon Code: 15OFF at checkout! Wow, it's hard to believe that Christmas is less than 2 weeks away! I've been so busy with work that I hadn't had time to update my blog ... until now! So, have you completed your holiday shopping? There is still time to get last minute, affordable, thoughtful gifts for friends, family and co-workers. "See Harmony & Balance" Bracelet. Both are handcrafted and one of a kind pieces. Be the FIRST and ONLY owner of these customized pieces OR buy and give as stocking stuffers. Stop by either my Etsy: www.etsy.com/shop/gigi1233 or www.shop323.net to make your purchase! Hope everyone has safe and exciting weekend...I'll be off to do some retail therapy!